Chelsea were beaten by Everton despite completely dominating the first half. Here’s how we rated each Blues player in the 2-0 defeat at Goodison Park.. He was untroubled in the first half but was busy from then on. He could do nothing about the first goal after his initial save and was unlucky with the penalty after another decent stop. 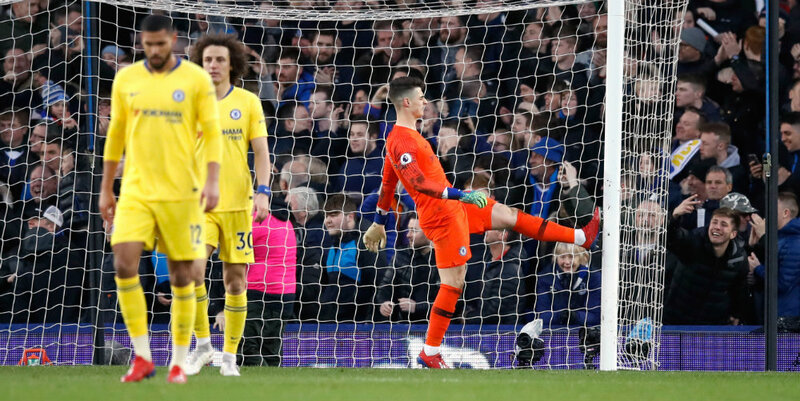 Kepa also made a couple of other good saves. The ever-dependable Spaniard did nothing wrong defending his own goal, but although he saw plenty of the ball at the other end of the pitch he was unable to make a difference in the final third where he too often opted for the easy option. Excellent in open play and composed in possession. However, Chelsea’s zonal marking from corners led to chances from every one Everton had and, like David Luiz, Rudiger was too static. As with Rudiger, Luiz was generally excellent but should have done better for the first goal. He had a more than steady opening 45 minutes but then began to struggle both positionally and with ball at his feet when tested defensively. His naive challenge conceded a needless penalty and as good as ensured defeat. He ran the midfield in the first half, barely giving the ball away and making the most of Everton’s reluctance to properly press Chelsea, but after the break he was far less influential as the home side change their tactics and denied him space. Covered a tremendous amount of ground but failed to capitalise on his smart bursts forward into opposition territory. Unsurprisingly the former Everton man was booed endlessly but seemed to thrive on the abuse, responding during a fine first half where he was central to Chelsea’s dominance. The change of approach by the hosts disrupted Chelsea’s rhythm thereafter and he was withdrawn after a couple of hefty tackles. He was so unfortunate not to score with a powerful run across the box where he resisted several strong challenges and narrowly shot wide and he remained industrious and involved, but too often lacked a final ball when he got himself in good areas. Chelsea’s star man scared the life out of Everton from the off and could easily have had two early goals. He remained a threat although he did surrender possession more than usual throughout. But his impact became increasingly nullified after Everton went ahead. Sharp, lively and matched good movement with good touch and awareness, Higuain looked the part before making way for Olivier Giroud. A deft touch almost led to Jorginho scoring, he made a brilliant trademark spin in behind but saw his shot blocked and so nearly scored with a deflected effort after the interval. Brought more purpose and a greater attacking threat but was regularly crowded out by a packed defence. The Frenchman saw very little of the ball after coming on and consequently contributed very little. He also missed a glorious late chance to pull a goal through a close-range header deep in stoppage time. An impressively lively cameo in which he was unlucky not to score with a shot after cutting on from the right.